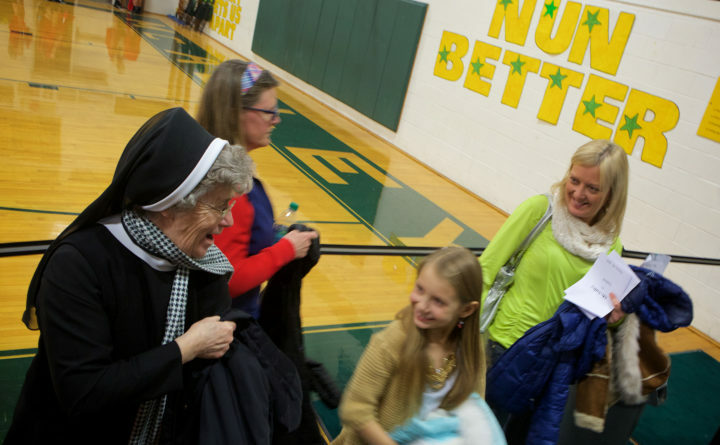 Fans celebrate after a basketball game at Maine Girls' Academy, formerly known as Catherine McAuley High School, in 2016. PORTLAND, Maine — The Maine Girls’ Academy says any effort to reopen the school would have to “start from scratch,” as the school is $250,000 in debt. The announcement at a private meeting Monday isn’t dissuading alumnae and others who are vowing to reopen the school and began fundraising immediately after the Portland school’s closure was announced last week. The Portland Press Herald reports the school has released all of its teachers, shuttered its summer program, refunded money to parents and plans to close for good this Sunday. Officials say reasons for the closure include that fall enrollment this year would have only been 76 students and the school only had one more year on its lease before it had to decide between extending the lease 25 years, or purchasing the building outright.